Originally released for PC in 2014, Astebreed is an attempt a more cinematic take on the scrolling shoot ’em up. That doesn’t necessarily mean more narrative-focused, but in lieu of the genre’s usual static side-on or top-down camera, Astebreed dances between different perspectives and employs camera cuts in a way that you’d expect of a cinematic action game (or, indeed, as you’d expect of a film). It doesn’t always work as well as it ought to, but at the very least, it gives the game its own identity in an increasingly crowded genre. At first glance, Astebreed looks like your typical side-scrolling shoot ’em up: you manoeuvre your XBreed mech unit up, down, left, and right within the screen area while the automatic scrolling of the background conveys a sense of constant forward momentum. 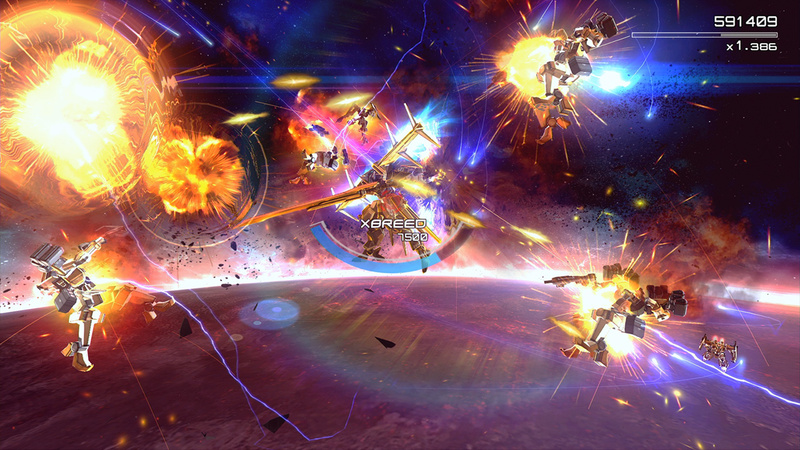 Enemies fly in from the left in set waves and patterns, and you shoot them down. But then your XBreed swerves towards the foreground, and the camera pans around to follow it. Next thing you know, you’re playing a vertically-scrolling game, looking upon your mech from above while enemies fly in from the top of the screen. Another shift in perspective and you’re playing a sort of on-rails third-person shooter game, looking on from behind your mech and shooting down enemies as they hurtle towards you from the depths of the screen. It’s not always these sorts of game-altering shifts, though. The camera sweeps around with your ship as you blast your way through hyperspace, and follows you as the “track” that the automatic scrolling is tied to weaves through a city skyline. Fundamentally it’s still the same game when this happens, but instead of a camera locked in place while a flat background scrolls past, it’s like the plane of action is set out on a film strip that’s laid out in and around a 3D world. For the most part, this works well. Those camera shifts create a sense of momentum that the typical fixed scrolling never could, and the different perspectives mix up the way the game plays in small but noteworthy ways. At the same time, it can be a source of confusion when, for example, the angle obscures whether a group of enemies is “in play”, so to speak, or still making their way through the background to the active playing field. The third-person sequences are particularly frustrating because the game doesn’t do a great job of conveying depth, so it’s difficult to tell how far away your enemies are until they fly right by you. Luckily, these over-the-shoulder moments are short-lived and make up only a small part of the game. 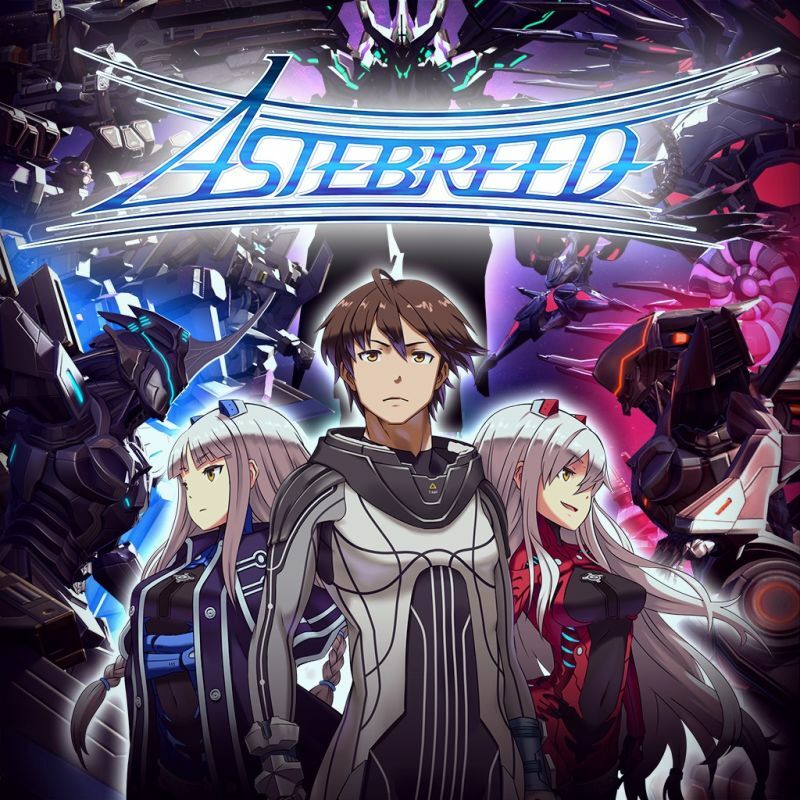 Alongside the cinematic camerawork, Astebreed also looks to tell a more involved story than one would usually expect from a shoot ’em up, but this is less successful. The story itself is fine—it’s a run of the mill sci-fi adventure with some interesting characters, surprising twists, and complicated backstory. The problem that arises is that most of the narrative is delivered by way of near-constant audio snippets during play, which are untranslated; there are English subtitles, but they’re small, hard to read, and pushed off to the corner of the screen. 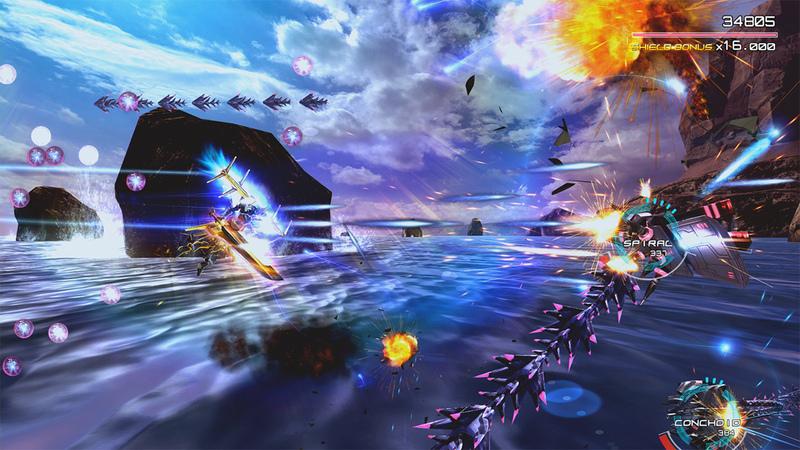 By Astebreed‘s very nature as a shoot ’em up, you can’t really take your focus off the action for a second. Unless you can understand Japanese, the only options for picking up the story are just letting yourself take a few hits every few seconds when a new dialogue box pops up, or to wait until the game’s conclusion and then read up on the summaries you’ll find unlocked in a library menu. Neither of these options is ideal, and they take all the wind out of the sails of a story that would be at least reasonably entertaining if you could experience it properly first-hand. Ultimately, though, Astebreed is still a shoot ’em up, and so the main appeal for most is going to be dodging waves of bullets and fighting for ever higher scores. In this, the game delivers with aplomb: the scoring system is deep and complex, aided by a wide array of weapons. As well as your standard spread shot and charged homing shots (which, while very handy, weaken your main cannon temporarily), the XBreed—like any self-respecting mech—sports a giant sword. Some enemies are more susceptible to slashes than cannon fire, or vice versa, and the sword also has the very handy ability to dispel certain enemy shots. On top of that, you’ve got a handful of different special moves that you can unleash when your special bar is full, each of which has its own use—one’s good for clearing the screen; another does big damage in a small area, and a third does massive single-target damage. Obviously, all these weapons have their own usefulness in dealing with the variety of threats you face, but switching between them is also at the core of the scoring system. In short, using the cannon and homing shots builds up a multiplier, which then magnifies the score you get by killing enemies with your sword, which in turn reduces the multiplier. It’s not enough to just alternate between shots and sword; you also want to think about which foes you actually spend your multiplier on, so that you’re not wasting all your hard-earned scoring potential on a couple of grunts when something far more lucrative is just around the corner. This, of course, compounds with the natural strengths and weaknesses of each weapon and the enemies you’re up against to create a rather intricate dance of gunfire and swordplay. Astebreed is also far more approachable than your typical shoot ’em up, mostly thanks to the fact that you can weather quite a few hits before you die and your shield regenerates over time. On the easiest difficulty, there’s very little threat of death until the final boss, and even then, you can retry from the beginning of the fight as often as you need to. At the other end of the scale, the sheer force of numbers creates plenty of challenge, and making the most of every weapon at your disposal is crucial to getting through alive. This makes for a game that’s thoroughly enjoyable, even if it does sometimes fumble over its own ambitions. 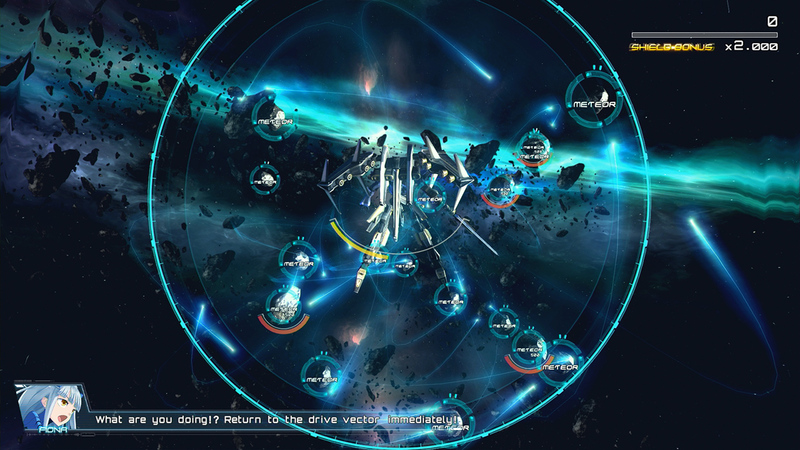 The narrative delivery is a weak point, particularly for the localised release, and the more cinematic approach to a scrolling shooter sometimes creates confusion. At the same time, that very cinematic quality stands Astebreed apart from its peers and gives it a sense of momentum and excitement in between the shots fired. Between that and its deep, satisfying scoring system, it’s a welcome addition to the Switch’s ever-growing library of shoot ’em ups.